Do you ever have day-old bread? You know bread once it has passed its prime, or perhaps you are making a recipe and you need some bread crumbs. 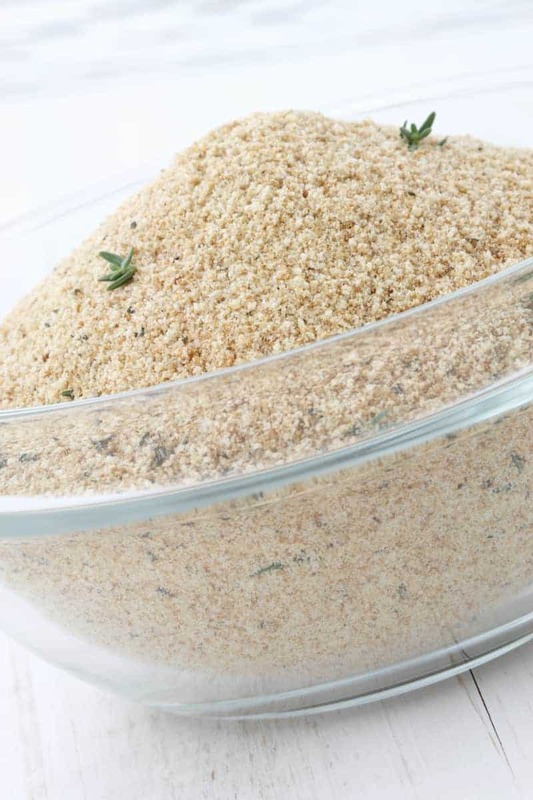 Maybe you don’t want to drive to the store to go out and get some bread crumbs, I can show you how to make your own homemade Italian seasoned bread crumbs from scratch. A lot of different recipes use Italian seasoned bread crumbs, I have made the Olive Garden Fried Mozzarella with Italian seasoned bread crumbs. You can dredge chicken breasts with these and saute them with some butter or olive oil and you will have dinner in a flash. You don’t need to buy them store-bought, you can make them at home. I personally love to save money where ever I can. It is hard to stay on a budget but I love to take shortcuts where I can and save a little bit here and there. By making homemade substitutes for items I would normally buy out I can save money. While bread crumbs won’t break the bank, if you are like me, you may have leftover bread that has passed its prime, but you can still use it. Now don’t use bread that is moldy, throw that away. You can use leftover sandwich bread, Italian bread, French bread or whatever you have on hand to prepare your own bread crumbs. After my bread is dried out I season this with a blend of Italian herbs, some onion powder, and if you like a little garlic powder, and you will have some wonderfully seasoned bread crumbs. Place 8 slices of bread on a half sheet cookie sheet, if you house is dry allow the bread to dry out. If your house is humid you need these quickly place the bread into a 200 degree oven until the bread has dried out, and then flip the bread over and allow the bread to dry out on the other side. This should take 5 to 7 minutes on each side. Crumble bread into a bowl and add salt. Rub the Italian Seasonings between your hands to release the aromatic oils and then place those into the bowl. Add onion powder, and garlic powder if desired. Stir to combine. Store in an air tight container. Can we do thiswith leftover garlic bread? I would use leftover garlic bread to make croutons! After I make and season the crumbs how long of a shelf life does it have. Can I keep it in an airtight container on a shelf in my pantry or does it need to be in the fridge? I don’t know what the exact shelf life of these are, I think they would be good for 4 to 6 weeks, beyond that I would consider storing these in the freezer, or try to use an air tight container. I am glad I could help. There are a lot of things like this we can quickly make at home. Money goes much better in my pocket than someone else’s. How long can I leave bread out to dry slowly? Or does it have to go in the oven? I like to use my food processor to crumb with seasonings. I also store old bread in freezer until ready to use for breadcrumbs, casseroles, French toast, bread puddings, etc. great way to save. Great idea on saving money. 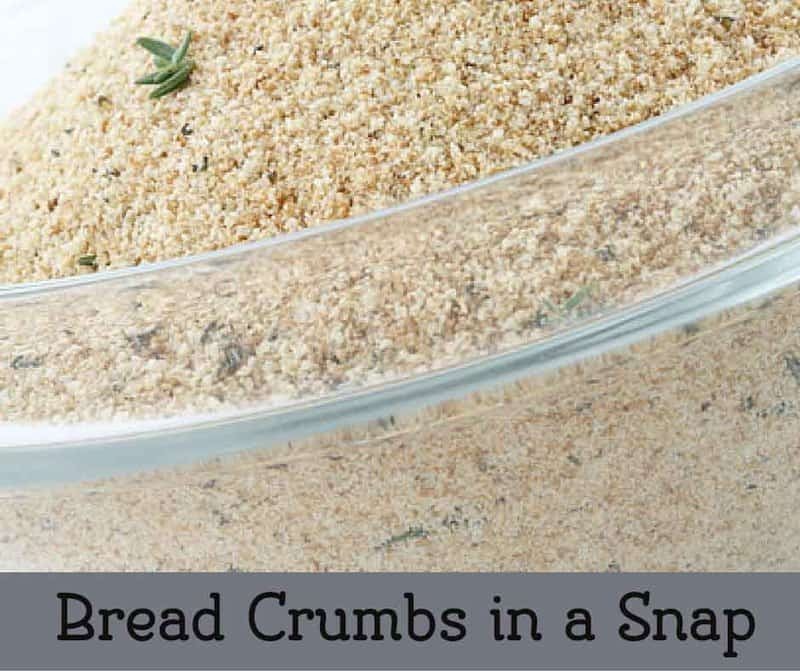 Fresh bread crumbs can be quickly made in your blender and then dried. I really appreciate your suggestion. I will give it a try.